There are so many products that I’m loving right now – payday seems to have come and gone and I still haven’t bought half of the things I need ( for need read desire, covet and lust after!). First up is this Gatineau Activ Eclat Bright and Radiant Skincare Collection. It costs £49.00, a saving of 65% and delivery is free here. The set contains 5 products – Gatineau Radiance Enhancing Gommage 75ml, Gatineau Collagen Eye Compresses x 2, Gatineau Flash Radiance Serum 15ml, Gatineau Activ Eclat Radiance Energising Cream 50ml, Gatineau DefiLift Lip 10ml and a Gatineau Tweed Bucket Bag. Quote Code: RED10 to get 10% off at Look Fantastic – valid until midnight on the 11th of February. Exclusions apply. Next up is a set by my favourite body care people – L’Occitane. This is the L’Occitane Delicate Cherry Blossom Collection. It’s just £34.00 – a saving of 34% and there is free delivery here. This set contains: L’Occitane Cherry Blossom Eau De Toilette 50ml, L’Occitane Cherry Blossom Body Lotion 75ml, L’Occitane Cherry Blossom Shower Gel 75ml, L’Occitane Cherry Blossom Bath and Shower Gel, L’Occitane Cherry Blossom Hand Cream 30ml. The hand cream is a special favourite of mine. It’s not greasy, gives great protection and the smell is divine. Again Quote Code: RED10 to get 10% off Lookfantastic valid until midnight on the 11th of February. Exclusions apply. Now – for the Prada L’Eau de Toilette Gift Set. This is such a cute gift set and I’m only sad that no-one is going to be buying this for me. I’m tempted to have it delivered and pretend I have a secret admirer! The gift set contains: Prada Candy L’Eau de Toilette Spray 50ml and Roll-on 10ml. It’s on offer here from Escentual at £40. 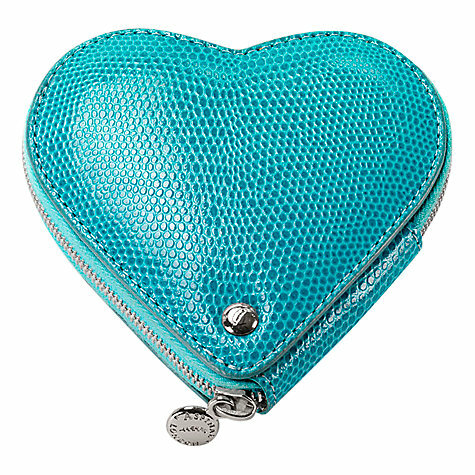 Still on the valentine theme but away from the pink theme is this classy Aspinal of London Lizard Print Leather Heart Coin Purse. It costs £55.00 and there are click and collect and delivery options here. This is definitely a wish and not an expectation. It’s not an essential but is entirely decadent. Now I just need to find the right man to make my wishes come true! Previous postValentine’s Day beauty pick! Next postDear Estee Lauder I’ve Been Cheating On You With Clinique! Thank you I’ll look now!